UNT achieved a record-breaking fundraising year for the university. A devastating hurricane season cements alumna's passion for work as a meteorologist. Computer science alumni use innovation to solve problems and create new technologies. Time to celebrate multiple conference championships and a bowl game bid. Mean Green Racing earns personal best; faculty member earns major honor. Amy Friedrich-Toulouse remembers her grandparents. How can you best pair wines with holiday meals? Members of the Class of 1967 celebrated their 50th anniversary by sharing a few memories. The largest-ever version of the UNT Battle Flag is flying outside Apogee Stadium. UNT is poised to become a global leader in education innovation. John Colaruotolo earned degrees in music, but plays to a different crowd as a workshop facilitator. Hannah Olowokere makes impact by raising funds to help her hometown community rebuild. The Mean Green head for the R+L Carriers New Orleans Bowl Dec. 16. 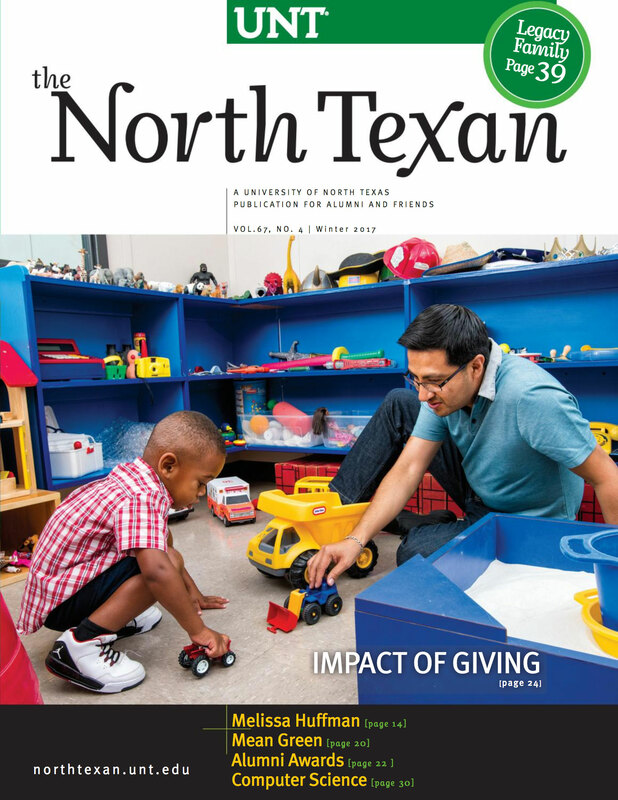 UNT earns $1.6 million grant grant from Greater Texas Foundation. Grant allows UNT to prepare bilingual, English as a Second Language teachers. Two new scholarship funds available to UNT students for the 2018-19 academic year. UNT alum Hector Rodriguez uses his comic book series to help represent Latinos in the media. UNT professors received HHS grant to study health disparities. Donald Trump Jr. speaks at UNT's event that raises money for scholarships. UNT professor Manish Vaidya studying new methods for young patients undergoing radiation therapy. UNT, Collin College to team up in 15-month Seamless Transfer Pathway Design Challenge. Three generations of the Waddell family select UNT. Four UNT TAMS students make regional finals for math, science and technology competition. UNT alumna, saxophonist Jessica Rose Dodge wins VSA Young Soloists Award. My days in Denton from 1967 to 1971 were some of the best of all my life. UNT inks partnership with Texas Motor Speedway, providing fresh opportunities for students. UNT alumna Helen Lucero creates award-winning career as curator, expert. Some of my favorite memories of North Texas are of attending the Demonstration School. Thomas R. Cundari received the 2017 Eminent Faculty Award. Playwright Moisés Kaufman, composer Bruce Broughton to work with UNT students. Over the years, many of my UNT colleagues have shared their stories of Bob Toulouse. UNT alumna Whitney Lovett-Shin finds nerds' dream job as producer for SYFY channel. Two articles in your fall issue caught my eye and brought back memories. UNT engineering professor Nandika D'Souza recognized by Women in Engineering ProActive Network. UNT researchers receive nearly $2 million grant studying ultrasound. Song by UNT alumnus Michael Solomon Williams lands global response. Stephanie Reinke to head UNT's Osher Lifelong Learning Institute. UNT alumna Julie Althaus Crawford wins lifetime leadership award for theatre work. UNT graduate student Trinity Kai's photography wins VSA Emerging Young Artists award.